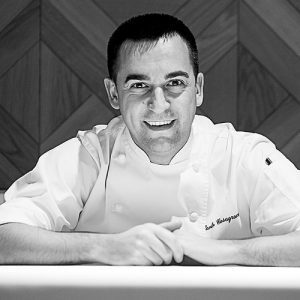 In 2003, Paolo Casagrande went to work restaurant Martín Berasategui Restaurant in Lasarte (Guipúzcoa). Due to his good work and his great capacity of work he wa placed by Martín Berasategui at the front of the recognized M. B. restaurant in the Ritz-Carlton, Abama (Canary Islands) where it obtains the first Michelin star for the Restaurant. He later directed the opening of Castadiva Resort, a luxury hotel on Lake Como (Italy). In 2012 Paolo Casagrande rejoins Martín Berasategui. The complicity and mutual trust between the two makes Martin put him to direct the kitchen at Lasarte restaurant in Barcelona, which has recently been awarded the third star in the Michelin Guide. Since February 2016, Paolo has been in charge of the gastronomic project of Monument Hotel, under the direction of Berasategui, the new Hotel of Great Luxury, which welcomes the Restaurant Lasarte, Oria Restaurant and Hall0 Bar. His career has been characterized by the depth of his commitment, consistency, constancy, effort and passion for cooking.